After working for years in the gaming industry (as an illustrator on such games as Legend of the Five Rings and World of Darkness), the artist Heather V. Kreiter has created her own line of rather scary-looking pony-themed merchandise under the moniker of My Little Demon. 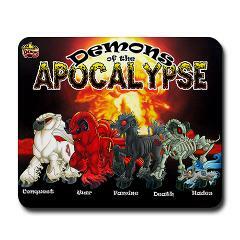 Featuring ponies with such names as Satana, Wretched Rainbow, and Velvet Decay, these mouse pads, blankets, aprons, and other products will keep you up at night with a weird combination of cuteness and chills. Check out her sales page at Cafe press to find out just how many products in how many designs she offers!